Dr. Sophia Sarkos received her medical degree from Ohio State University College of Medicine in 1993. She then performed her Internship at the Cleveland Clinic and completed both her Ophthalmology Residency and a one-year Clinical Research Fellowship at Tulane University, New Orleans, LA. Dr. Sarkos also completed an Anterior Segment and Refractive Fellowship with John Doane, M.D. of Discover Vision Centers in Leawood, KS in July 2004. 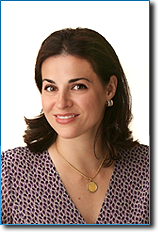 She is a Board Certified Ophthalmologist in private practice since 1998. Dr. Sarkos was born and raised in Ohio, where her parents still reside. Dr. Sarkos is married to fellow ophthalmologist and glaucoma specialist, Robert Barnes, MD and currently lives in Oak Brook, IL. She enjoys evening walks, traveling, ophthalmology mission work and spending time with family and friends – especially she and Dr. Barnes’ two grown children. Dr. Sarkos and her husband are both avid Chicago Bulls and Cubs fans, and enjoy a friendly sports rivalry when it comes to their alma maters.